With a brand refresh just a few months prior, Continental Office, a customized workplace solution provider, needed to update its 6-year-old website. The team wanted to ensure they were integrating buyer personas to provide an engaging user experience complete with relevant content marketing. Read how they increased traffic by 103% through the redesign strategy. For access to more B2B marketing content, subscribe to get the latest research and case studies from MarketingSherpa. The prefabricated construction unit is a technology-driven approach to building better. Also, workplace services help clients manage inventory assets, among many other things. “That’s why we say we create great spaces, because whatever you need, we can come in and help you create a space that's going to align to your business goals and organizational needs,” she said. Continental Office works a lot with culture and making sure that a business, along with its associates and clients, have a balance of an attractive space and a great experience. The company makes sure to understand associate’s work habits in order to build in practicality alongside aesthetics. For instance, looking at foot traffic in certain areas before choosing flooring options shows our understanding the need for ergonomic furniture solutions. The design teams focus on bringing humanity back into the workplace and will hold sessions with companies that they work with, which are essentially workshops for understanding how the company is working and evolving. With this purposeful approach to creating great spaces, Continental Office works with many different types of companies. The marketing team built their 16 different personas around the titles of people they typically work with. “It could be a CEO, it could be a facilities manager; we might also work with the purchaser and buyer, and these are throughout all of [our clients]. But if you get into health care, we may work with health care facility planners, and they think about things a little differently than our corporate facility planner might,” she said. The team also works a lot with the architect and design community who might seek insight about furniture or flooring during the planning phases, and even HR professionals, to help bring work culture to life in a space’s design. At 78 years old, Iannarino said, it was time to take a look at the brand to see how it had evolved and grown in the form of a brand redesign. “We might have had some clients who bought furniture from us but had no idea that we offer a branding capability or workplace services capability. So, our challenge was really to tell one succinct, clear story that would allow our associates and our clients to better understand who we were,” she said. The marketing team spent six months doing quantitative and qualitative research, interviewing associates and some clients as well “to really see how people perceived us,” she said. “Our website was one of our main challenges. We wanted to quickly grab that user’s attention and let them grasp who we are, why we do what we do and what we offer,” she said. Even before finishing the rebrand, the marketing team did a lot of research into the current website, why it wasn’t working and why it’s performance metrics weren’t what they wanted them to be. The team decided to move to an inbound marketing strategy to get the foot traffic on the site to boost metrics and truly answer those questions. 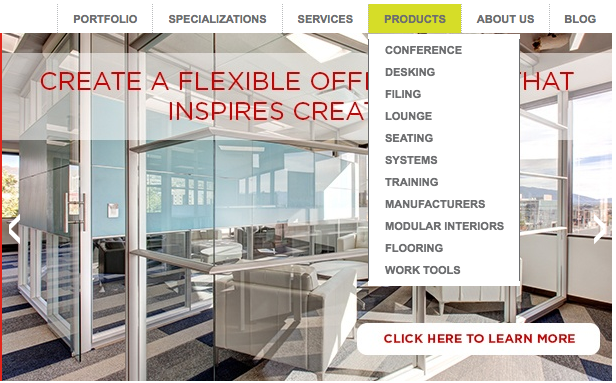 The team simplified the website navigation so that if a visitor clicks on the hamburger menu in the top right, they would see furniture, floors, walls, branding and services. The previous navigation made it difficult for visitors to get to the information they needed. Some options in the original menus were worded strangely, and it was poorly organized, overall. 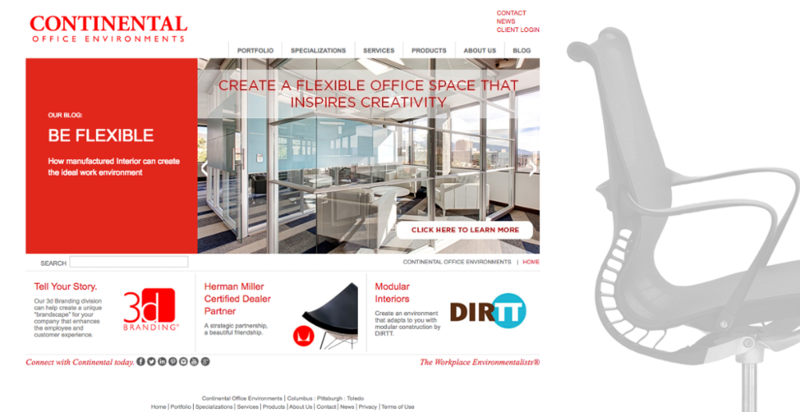 “We create great spaces with beautiful work environments, so our website also had to reflect that as well. It needed to look very creative, forward-thinking and be visually pleasing. So, it was a balance; it really was a balance of that great user experience and, at the same time, really showcasing who we are as a brand and why we do what we do,” she said. The brand’s tone on the website also became more informal as well. The team wanted to strike a conversational, yet still professional, tone, Iannarino said. “We've made an effort to be more conversational in tone and to be very approachable — because we're in this together. We want our clients to have a great experience — a great memorable experience — and we want to build those long-lasting relationships,” she said. Another element that Iannarino and her team incorporated this year was a pop-up, or lightbox, that appears to users the first time they visit the site and promotes new content like the brand magazine or a case study. “You're always worried that you're going to annoy somebody coming to your site with a pop-up or a form to fill out, but I haven't found that to be the case,” she said. Adding the pop-up has been worth the risk, she added, because they have gotten a lot of leads from it. If, through testing, the team realizes that a website element is not working, they try to understand why it’s not working and fix it before simply abandoning it. Previously, the team had no way of tracking and scoring prospects. With this overhaul of the website, they decided to integrate lead scoring capabilities. The team set up a series of actions that would, combined with metrics, quantify a marketing qualified lead. “I went in and manually assigned point values to different things that people do. So, whether that is opening in an email or clicking on a social link or downloading a piece of content, those are things we assign positive numbers [point values] to. Now if somebody unsubscribes from our blog or something like that, we'll assign a negative number,” Iannarino said. That way, the team could go into the contact database, see that a person has a score of 30 and understand that they are a marketing qualified lead. Whereas someone who has a score of eight, for example, is clearly not ready to be passed on to the sales team. “We really worked hard to identify [these prospects]. That was something new for us … But so far this year, we have identified more than 600 marketing qualified leads. So, what that tells us is that people are engaging on the site,” she said. Part of ranking up points as a marketing qualified lead is following along the consumer journey. Within each email campaign, Iannarino said, there are downloadable content offers as well as nurturing emails. Alternately, if someone downloads a piece of content from the website, the team has their email address. That person will get a follow-up email a day or so after that download to thank them as well as offer them another piece of relevant content. “For instance, they could download, let's just say, a white paper. Well, they're at that far end of the journey where the next step might be to do a follow-up email with, ‘Hey, here's a great checklist,’ and that checklist takes them further into their buyer journey,” she said. Adding in this nurturing aspect was incredibly important, she said, especially understanding the right time to turn that prospect over to the sales team for follow up. From 2015 to 2016, Iannarino and her team focused on building up inbound marketing efforts by creating a lot of relevant content. “We want people to see us as value-added, and we want to be known as thought leaders because we have a great team of associates with a lot of years of knowledge and expertise. That's a big part of who we are too. In addition to creating these great spaces that are purposeful and intentional for our clients and their associates, we also want to change the way they work and think,” she said. For instance, she added, a client or their associates might not understand why the Continental Office designers are lowering cubical walls, making open spaces, or why the company culture and history is displayed on the wall. “So we create a lot of content, and whether it's a case study, a white paper, video or our newly launched magazine … , we create all this value-added content and blog once a week to help our clients. We want to be a resource for them,” she said. 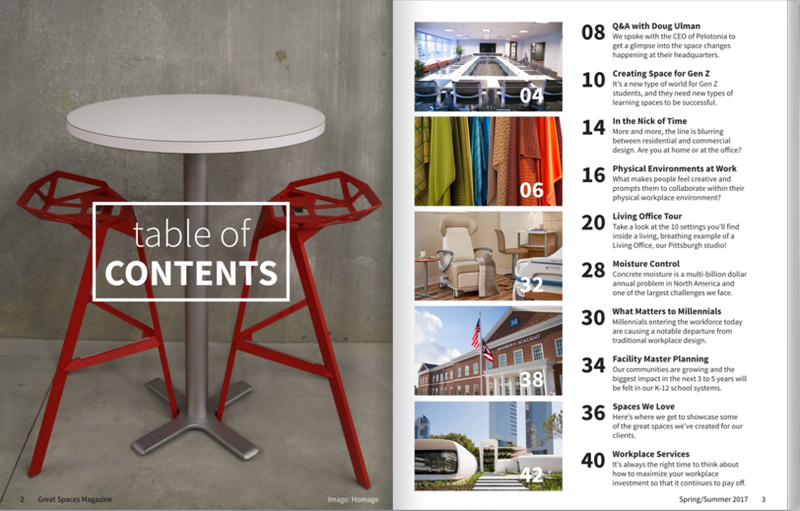 The ‘Great Spaces’ magazine is produced twice a year with a winter/fall edition and a spring/summer. Since launching, it has “probably brought in 100 leads for us that we can then hand over to Sales,” Iannarino said. 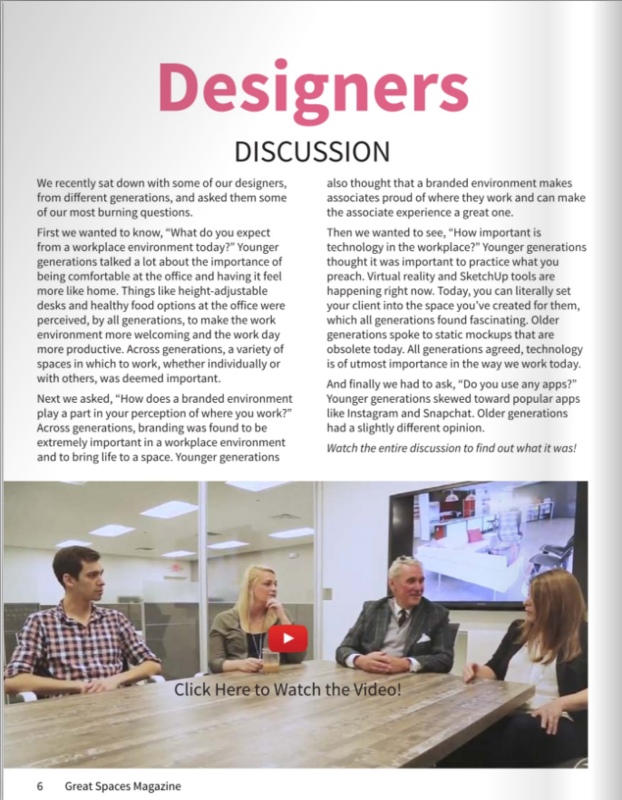 ‘Great Spaces’ answers questions, interviews Continental Office experts and even offers video content, since the magazine is digital. Since the team was new to aggressively creating this level of value-added content, Iannarino said they felt some nervousness when they put up an information gate for customers to download content. “We had some anecdotes too, where even our team was saying, ‘People aren't going to do that. I don't do that. I don't fill out anything,’” she said. Because of that success, the team has scaled up content production immensely. “We went from zero content in 2014 to … now we probably have 300 to 400 pieces of content out there, and those range from videos to case studies, to checklists, white papers and our biannual magazine,” she said. To promote all of that content, this year to date the team has sent over 41,000 emails, which is up 770% compared to the previous year. To support the increased content and email marketing output, Iannarino said they went from a team of two, to a team of four. “It's always a challenge, of course, because we do so much of it, and I'm sure any organization feels that stress — trying to organize it all, making sure you're not sending too many emails, making sure your social is coordinating back to it and that your email campaigns are purposeful” she said. They use their inbound marketing platform to schedule everything out in advance, to lighten the load on their small team and to ensure that it all is telling a complicit story. In order to come up with topics, the team often looks to the company’s manufacturing partners. Many of whom do a lot of their own content and research, which helps the marketing team know what some of the trends and concerns of the industry are. As a 78-year-old company, they also have a lot of internal expertise to draw from. “We're really fortunate and we have a lot of people who have been here … some 40 plus years. So, we take a lot of that internal knowledge; that's why you'll see blogs from a lot of our different associates as well,” she said. “The response has been so worth it … just this year to date, we've had over 170 new contacts who came in as a result of this online marketing. Those are all potential leads for Sales and potential people who we can help,” she said. A lot of the new contacts are from organic search, Iannarino said, perhaps even most of them. “That tells us that the content we're creating and the keyword research that we're doing to understand what our audience is searching for is really working. It seems to be a good strategy for us,” she said. Once the team had put this focus on content, they also began seeing the importance of search engine marketing. “We really took a hard look at our SEO … did we have meta tags, did we have keywords in there at all? … So we started implementing that,” she said. In the first year of moving to an inbound marketing model, including the increased SEO efforts, they saw a web traffic increase of 1,395% between 2014 to 2015. With the focus on building up this infrastructure for helping people find Continental Office, organic search also increased by 926%. “[Inbound marketing] works. It works in ways I never even imagined … honestly, it's a great way to align your sales and marketing team, which, for a lot organizations — every one I've ever been in — is a struggle. But it’s accomplishable by doing this sort of content marketing, optimizing your website and by having a consistent and great brand story; it draws people in,” she said. Continental Office has decided to expand its customer experience beyond just the website, Iannarino said. Headquarters is in Columbus, Ohio, but the company is getting ready to create a second location downtown that will act as a creative studio. “Again, it ties back to the brand. We can digitally show you all these great photographs, but we're also going to build out a space that's really modern and creative with a very design-focused feel, so that our clients can come in and they can experience it too,” she said. It’s a place where clients could come visit to not only visualize the kind of spaces that Continental Office creates, but actually work out of one. “There'll be embedded technology, ergonomic furniture, flexible spaces that feel almost residential —there will be lots of really great features. Providing associates with choices as to how they work is key. We've even gone high-tech with our conference room bookings and have iPads on the outside of every conference room,” she said. The whole goal is to create a complete and cohesive brand experience for clients, she added, from website to an in-person studio visit. “You have to know what story you want to tell,” Iannarino said. The old website was fine at the time, she said, but it wasn’t built around telling that whole story while understanding the customer journey. “In creating that great user experience, you have to stay relevant with what people are looking for and then build your website around that, which I believe is what we did and has allowed us to have these successful results,” she said. “Even though we had such great results last year, it's already up — the number of new contacts is up over 80% from last year already. And I can't lie; I keep waiting for these numbers to kind of plateau, but fortunately for us, the results just keep trending in a positive way,” she said. The first couple of years of this journey was about getting people to the website and then engaging with it. Last year and this year, they’ve focused on the sales and marketing alignment. Marketing 101: What is a lightbox?